It’s election season and the presidential debate isn’t the only debate going on! We’re having our own IZKALI debate between the aged expressions Reposado and Anejo! Below you will find a breakdown of the two tequilas’ platforms. For those of us who don’t speak Spanish, what does each of your names mean? Izkali Reposado: “Reposado” means rested. Izkali Añejo: “Añejo” means aged. How long have you been aged? What foods do you go best with? Izkali Reposado: Try me with spicier foods, poultry and pork. Izkali Añejo: Sweet and fruit-based foods. Please give us a specific dish one might find you paired with? Izkali Reposado: Braised chicken with a reduction of orange juice, tequila and honey topped with a sprinkle of cinnamon. Izkali Añejo: I have a sweet tooth; therefore you’ll find me next to a Chocolate Lava Cake with Raspberry sauce. Are there any special ways tequila aficionados tend to enjoy you? Izkali Reposado: I make an amazing cocktail, margaritas, palomas – you can’t go wrong! What sizes are you available in and what are the prices? Izkali Reposado: .750 or 1.75 – ready for individual cocktails or big parties! 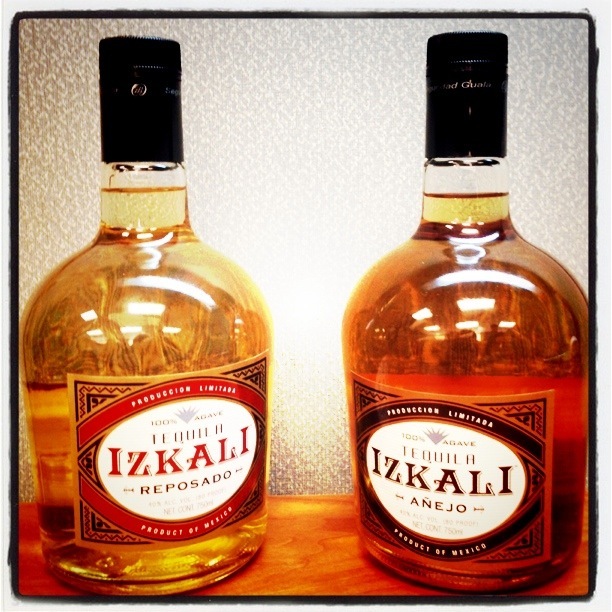 Izkali Añejo: .750 – I am only available in .750 – but you can always buy 2! Which aged Izkali Tequila is to your taste? Prizes will be involved so please check in with our Facebook page for more details and updates! Get ready to cast your vote on Monday, November 5th and Tuesday, November 6th!